This evening I want to share with you a card I made for a co -worker about 2 to 3 weeks ago as my appreciation and understanding that things don't always stay the same - and that could be a good thing! I used some patterned paper from BG - Sweet Threads. I am really sinking my teeth into all the 6 x 6 paper pads out there on the paper crafting market. They are so perfect for card makers. My card base is from PTI and the color is Hawaiian Shores. I love PTI and the weight of their card stock! I am also into circles right now for some reason. Depending on how the arrangement of them are, and the colors - the eye really does go right to them - and it is very appealing. I also punched out some butterflies using my Martha Stewart 3 in 1 butterfly punch. 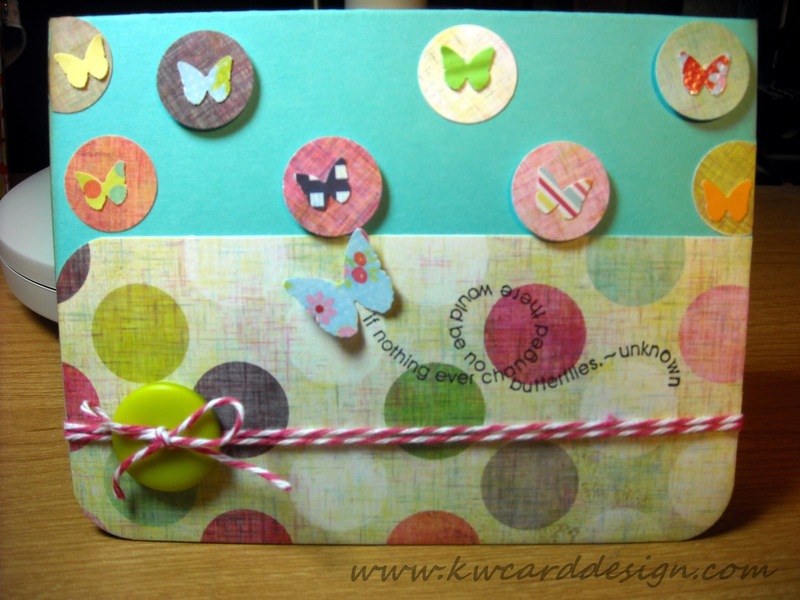 I glued some of my circles directly on my card base and some I popped up with dimensionals or pop dots. My sentiment comes from SU! "Flight of the butterfly". To finish off my card, I added some bakers twine and a button from BG. I will be back in a few days if not sooner with another creation. Thanks for stopping in! !